A decision tree is one of most frequently and widely used supervised machine learning algorithms that can perform both regression and classification tasks. 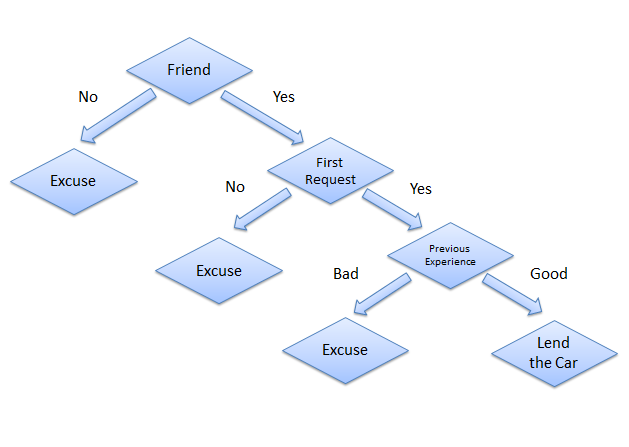 The intuition behind the decision tree algorithm is simple, yet also very powerful. For each attribute in the dataset, the decision tree algorithm forms a node, where the most important attribute is placed at the root node. For evaluation we start at the root node and work our way down the tree by following the corresponding node that meets our condition or "decision". This process continues until a leaf node is reached, which contains the prediction or the outcome of the decision tree. Is this person a close friend or just an acquaintance? If the person is just an acquaintance, then decline the request; if the person is friend, then move to next step. Is the person asking for the car for the first time? If so, lend them the car, otherwise move to next step. Was the car damaged last time they returned the car? If yes, decline the request; if no, lend them the car. Decision trees can be used to predict both continuous and discrete values i.e. they work well for both regression and classification tasks. They require relatively less effort for training the algorithm. They can be used to classify non-linearly separable data. They're very fast and efficient compared to KNN and other classification algorithms. In this section, we will implement the decision tree algorithm using Python's Scikit-Learn library. In the following examples we'll solve both classification as well as regression problems using the decision tree. Note: Both the classification and regression tasks were executed in a Jupyter iPython Notebook. In this section we will predict whether a bank note is authentic or fake depending upon the four different attributes of the image of the note. The attributes are Variance of wavelet transformed image, curtosis of the image, entropy, and skewness of the image. For more detailed information about this dataset, check out the UCI ML repo for this dataset. The rest of the steps to implement this algorithm in Scikit-Learn are identical to any typical machine learning problem, we will import libraries and datasets, perform some data analysis, divide the data into training and testing sets, train the algorithm, make predictions, and finally we will evaluate the algorithm's performance on our dataset. In this case the file "bill_authentication.csv" is located in the "Datasets" folder of "D" drive. You should change this path according to your own system setup. The output will show "(1372,5)", which means that our dataset has 1372 records and 5 attributes. In this section we will divide our data into attributes and labels and will then divide the resultant data into both training and test sets. By doing this we can train our algorithm on one set of data and then test it out on a completely different set of data that the algorithm hasn't seen yet. This provides you with a more accurate view of how your trained algorithm will actually perform. Here the X variable contains all the columns from the dataset, except the "Class" column, which is the label. The y variable contains the values from the "Class" column. The X variable is our attribute set and y variable contains corresponding labels. In the code above, the test_size parameter specifies the ratio of the test set, which we use to split up 20% of the data in to the test set and 80% for training. From the confusion matrix, you can see that out of 275 test instances, our algorithm misclassified only 4. This is 98.5 % accuracy. Not too bad! The process of solving regression problem with decision tree using Scikit Learn is very similar to that of classification. However for regression we use DecisionTreeRegressor class of the tree library. Also the evaluation matrics for regression differ from those of classification. The rest of the process is almost same. The dataset we will use for this section is the same that we used in the Linear Regression article. We will use this dataset to try and predict gas consumptions (in millions of gallons) in 48 US states based upon gas tax (in cents), per capita income (dollars), paved highways (in miles) and the proportion of population with a drivers license. The details of the dataset can be found from the original source. The first two columns in the above dataset do not provide any useful information, therefore they have been removed from the dataset file. Now let's apply our decision tree algorithm on this data to try and predict the gas consumption from this data. As with the classification task, in this section we will divide our data into attributes and labels and consequently into training and test sets. Here the X variable contains all the columns from the dataset, except 'Petrol_Consumption' column, which is the label. The y variable contains values from the 'Petrol_Consumption' column, which means that the X variable contains the attribute set and y variable contains the corresponding labels. As mentioned earlier, for a regression task we'll use a different sklearn class than we did for the classification task. The class we'll be using here is the DecisionTreeRegressor class, as opposed to the DecisionTreeClassifier from before. Remember that in your case the records compared may be different, depending upon the training and testing split. Since the train_test_split method randomly splits the data we likely won't have the same training and test sets. The mean absolute error for our algorithm is 54.7, which is less than 10 percent of the mean of all the values in the 'Petrol_Consumption' column. This means that our algorithm did a fine prediction job. In this article we showed how you can use Python's popular Scikit-Learn library to use decision trees for both classification and regression tasks. While being a fairly simple algorithm in itself, implementing decision trees with Scikit-Learn is even easier.